We are making available this award-winning, nine-part PBS series in three different settings: on Shabbat mornings, at the Taunton Public Library and as part of our seventh-grade B’nai Mitzvah curriculum. Here’s the 2018-2019 public program schedule in the lower level meeting room/auditorium at Taunton Public Library, 12 Pleasant Street, at 6:00 PM. 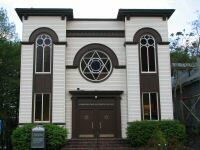 See the above listing for Shabbat mornings for full title of each session/program.